From 9.00pm sharp: Poets compete over two rounds. Three judges score for Content, Performance, Audience Reaction and Timing. You can listen to Miceál’s reading here. Miceál Kearney, 37. Living and working on the family farm in South Galway. Published and performed throughout Ireland, U.K, America and features very prominently in the parish newsletter. Winner of the Cuisle, Cúirt, North Beach Nights’ and Baffle Poetry grand slams. Read as part of Poetry Ireland Introduction Series in 2008. Doire Press published his debut collection Inheritance in 2008. Arlen House published his 2nd collection The Inexperienced Midwife in 2016. In-between arguing with vegans on Facebook, he also writes plays. 3 of which have been staged. But his crowning achievement to date: not being banned from Tumblr. You can listen to Tamara’s reading here. Tamara Miles teaches college English and Humanities. Her poetry has appeared in various publications including Fall Lines; Pantheon; Ó Bhéal Five Words, Tishman Review; Animal; Obra/Artifact; Rush; Apricity; Snapdragon; Crosswinds Poetry Journal; Whatever Our Souls, The Cenacle, The Blue Nib, and Oyster River Pages. A 2016 contributor at the Sewanee Writers’ Conference and a resident at Rivendell Writers Colony in August, 2017. She has an audio poetry journal/radio show at SpiritPlantsRadio.com called Where the Most Light Falls. Karen J McDonnell lives in the Burren, north Clare. She is a 2017 Hennessy/Irish Times New Irish Writing shortlisted writer. Her writing has appeared in the Irish Times, Clare Champion, Freehand 5, Crannóg, Brain of Forgetting, The Stony Thursday Book, The Honest Ulsterman and in the Words on the Waves, Wild Atlantic Words, and Poetry NI:Poems for Holocaust Memorial Day 2016 anthologies. She has been published by Poetic Diversity and the Sybaritic Press in the U.S. Her poems have been listed in and won several competitions: most recently the 2017 Robert Monteith, Poems for Patience, and Dermot Healy prizes. Non-fiction was nominated for Best of the Net in the U.S. She holds a BA in Classics & History, and a Diploma in Radio Production. Last year, she was awarded a Tyrone Guthrie Bursary by Clare Co. Council, which enabled her to work on her first poetry collection This Little World (Doire Press, 2017). For more visit www.karenjmcdonnell.com. 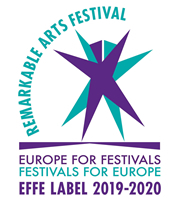 The competition shortlist of thirty poetry-films will be screened in two parts at the Blacknight Festival Centre, in The Village Hall on Patrick’s Quay, Cork. The films were chosen from 186 submissions from 29 countries, completed in the last two years. Ó Bhéal’s 2017 judges, poet Lani O’Hanlon and filmmaker Shaun O’Connor, will select one overall winner to receive the IndieCork festival award for best poetry film. The 2017 Shortlist with Screening times, stills and biographies is here. Dairena Ní Chinnéide is a bilingual poet from the Dingle Peninsula. The most recent of her nine published collections is Fé Gheasa : Spellbound (Arlen House, 2016). She has received numerous awards for her writing, including the Patrick and Katherine Kavanagh Fellowship. She is a workshop facilitator with Poetry Ireland’s Writers in Schools Programme and has been appointed as current Irish Language Writer in Residence for DCU for 2017-2018. She previously worked as a broadcaster, managing director of film and television company, Smerbhic Teo., and an interpreter in the European Parliament. Eamonn Lynskey is a poet and essayist whose work first appeared in the New Irish Writing pages of the Irish Press in the 1980s, edited by David Marcus, and since then widely in many leading magazines and periodicals such Poetry Ireland Review, Cyphers, The Irish Times, Senior Times and many others. He was a finalist in the Strokestown International Poetry Competition and in the Hennessy Awards. He has been involved in the organization of poetry events in Dublin for many years and has presented poetry programmes on local radio. A graduate of UCD, he holds an MA from DCU and an M. Phil in Creative Writing from Trinity College Dublin. In 2013 he participated in the Stanza Poetry Festival in St. Andrews in Scotland. Before retirement he worked as a teacher and Adult Education organizer. It’s Time (Salmon Poetry, 2017) is his third collection, available at the Salmon website, here. You can listen to Elaine’s performance with Quango Reinhardt here. Ó Bhéal has hosted a jazz-poetry night since 2008 to coincide with the Cork Jazz Festival. It’s one of the series’ most popular events. The night begins as usual at 9.30pm with the five word challenge, followed by guest poet Elaine Feeney and Quango Reinhardt after which we have our usual open-mic session. We are very grateful to The Cork Jazz Festival for their continued support and supply of excellent jazz musicians. Elaine Feeney is an award winning Galway writer. She teaches at the National University of Ireland, Galway and St. Jarlath’s College, Tuam. Feeney has published three collections of poetry, Where’s Katie? (Salmon, 2010), The Radio was Gospel (Salmon, 2014) and Rise (Salmon, 2017). Feeney’s work has been translated, anthologized and recently published in, Poetry Review, Stonecutter Journal, Oxford Poetry, The Stinging Fly and The Manchester Review. In 2016 Feeney was commissioned to write the narrative to Wrongheaded, a stage and film production by Liz Roche Company which is currently on International tour and was shortlisted for the Bucharest International Film Festival and London’s Underwire Short Film Prize, 2017. Feeney, in collaboration with writers Aoibheann McCann and Aoife Nic Ferghusa completed a pilot comedy TV series in 2017, The Fannypack, which was Highly Commended by BAFTA. She has just finished her first novel, SIC[K]. You can listen to more from Quango Reinhardt here. 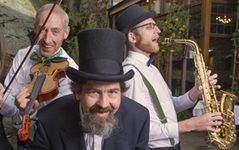 For Ó Bhéal’s 10th Jazz-Poetry night, the supporting jazz ensemble is Quango Reinhardt, with Patrick on vocals and keyboards, Iain on violin and Olly on saxophone. The trio will also play improv to the later open-mic session, so bring along your favourite poem and experience what it feels like being shallow fried in sweet jazz! You can listen to Özgecan’s reading here. Özgecan Kesici was born in Germany to Kazakh-Turkish parents, who now lives in Dublin’s inner city. She holds a PhD in Sociology from UCD. In 2015, she was featured as a migrant poet on Ireland’s Near FM 90.3’s Poetic Lives series. She has contributed two poems to the All the Worlds Between Anthology with Yoda Press, New Delhi. Özgecan, a confirmed Dublin Northsider, is currently working on her debut novel. Panchali Mukherji is a poet born in Calcutta, India who has lived and travelled globally. She has been listed in the Poetry International roster of poets worldwide. Panchali has been published by the Dedalus Press in the anthology Landing Places and by A&A Farmar in The Irish Catullus. Both books were launched at the City Hall in Dublin, Ireland. She is currently working on a collection of her poems and a script. Panchali is a communicator at heart. After obtaining two post graduate degrees, in literature and communications, she built a career in advertising, innovation research and teaching business before following her muse to write poetry. She is also a digital artist and emerging film maker. She has read her poetry and conducted sessions at various festivals and events globally, including The Cuirt Festival, Galway, The West Cork Literary Festival, Stonecoast MFA program at Howth, as well as in Shanghai and in Calcutta at the Literary Festival, Kalam 2017. For more about Panchali visit panchalimukherji.blogspot.com. You can listen to Theo’s reading here. Theo Dorgan is a poet who is also a novelist, non-fiction prose writer, editor, translator, broadcaster, librettist and documentary scriptwriter. He has published five books of poetry. His most recent collection is Nine Bright Shiners, published in 2014 by Dedalus Press. His two prose accounts of crossing the Atlantic under sail, Sailing For Home and Time on the Ocean; A Voyage from Cape Horn to Cape Town, won wide acclaim, as has his recently published first novel, Making Way (New Island Books, 2013). He has translated two collections of poetry by the Syrian poet Maram al-Masri, Barefoot Souls (Arc Publications, 2014) and Liberty Walks Naked (Southword Editions, 2016). His work has been widely translated: two full collections have been published in Italian and a selected poems in French. La Hija De Safo was published by Ediciones Hiperion, Madrid, in 2001. He has been editor of, among other titles, Foundation Stone, Notes Towards a Constitution for a 21st Century Republic (New Island Books 2013), Irish Poetry Since Kavanagh, A Book of Uncommon Prayer, What We Found There, Watching the River Flow and, with Gene Lambert, Leabhar Mor na hÉireann/The Great Book Of Ireland, a unique manuscript volume on vellum. He was awarded the O’Shaughnessy Prize for Poetry in 2010 and was the 2015 winner of the Irish Times Poetry Now Award for the best book of poetry published in 2014. He is a member of Aosdána. Brian Kirk is an award winning poet and short story writer from Clondlakin in Dublin. His first poetry collection After The Fall was published by Salmon Poetry in 2017. He was selected for the Poetry Ireland Introductions Series in 2013 and was shortlisted for the Patrick Kavanagh Award in 2014 and 2015. He was highly commended in the iYeats International poetry competition in 2011 and 2012, shortlisted for the Fermoy Poetry Competition in 2013 and commended in the Galway University Hospital Arts Trust Poetry Competition in 2014. He won the Jonathan Swift Creative Writing Award for Poetry in 2014, the Bailieborough Poetry Prize in 2015 and the Galway RCC Poetry Award in 2016. 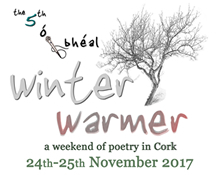 Ó Bhéal’s fifth Winter Warmer festival weekend will feature twenty-three poets who will read and perform over two days in our new and exciting festival home overlooking the Lee, The Village Hall, centrally situated on Patrick’s Quay, Cork city. This year’s phenomenal line-up features poets and peformers from eight countries and around Ireland, including Adnan Al-Sayegh, Biddy Jenkinson, Stephen Watts, Felispeaks, Rody Gorman, Catherine Ann Cullen, Daniel Salgado, Sophie Mayer, Richard Lambert, Keith Payne, Caitríona Ní Chléirchín, Brendan Cleary, Billy Ramsell, Órfhlaith Foyle, Stephen Sexton, Jennifer Matthews, Stephen James Smith, Niamh Prior, Edward O’Dwyer, Frank Golden, Mary Noonan, George Harding and James O’Sullivan. The festival also features poetry-films from the 5th Ó Bhéal Poetry-Film competition, a dance-poetry interpretation by Inma Pavon, poetry accompanied by music and a closed-mic set for ten local poets. We gratefully acknowledge our media partners the Evening Echo, along with festival sponsors The Long Valley Bar, The Arts Council, Foras na Gaeilge, The Farmgate Café, Dunnes Stores, Forum Publications, The Village Hall, Colmcille, Arc Publications, Isaacs Hotel, Cork City Council, Poetry Ireland, UCC English Dept, The Natural Foods Bakery, The Quay Co-op and Paradiso. You can listen to Jessamine’s reading here. Jessamine O Connor lives on the Sligo-Roscommon border, where she facilitates the weekly Wrong Side Of The Tracks Writers and The Hermit Collective, 2016 winners of the ‘Epic Award’ for Ireland. She was overall winner of the Poetry Ireland Butlers Café Competition 2017, and previously won both the iYeats Poetry Competition and the Francis Ledwidge Award. She was highly commended for Galway Hospital’s Poems for Patience 2017, and others incl. the Hennessy Literary Award, Over The Edge New Writer Of The Year and Bradshaw Books Manuscript Competition. She judged the New Roscommon Writing Award 2015, Roscommon Poets Prize 2017 for Strokestown Poetry Festival and she curated Roscommon events for National Poetry Day 2016 and 2017. Jessamine’s poems are published in Ireland and abroad, by journals including:Agenda, Fifth Estate, The Stinging Fly, Abridged; Poetry NZ, Muse-Pie Press, The Stony Thursday Book; Shot Glass Journal, Skylight47, Ropes, Crannog, and New Irish Writing. Also found in the books Voices From The Cave; Yeats 150; Relatives Remember; The Colour of Saying; and an e-book from Bogmans Canon. She was ‘Featured Poet International’ for the US publisher Muse-Pie Press from 2015 to October 2016, who nominated her for The Pushcart Prize, and she is currently working on a new collection. Her fourth chapbook Fusebox was launched in June at the Crossing The Tees Book Festival, and was published by The Black Light Engine Room Press.